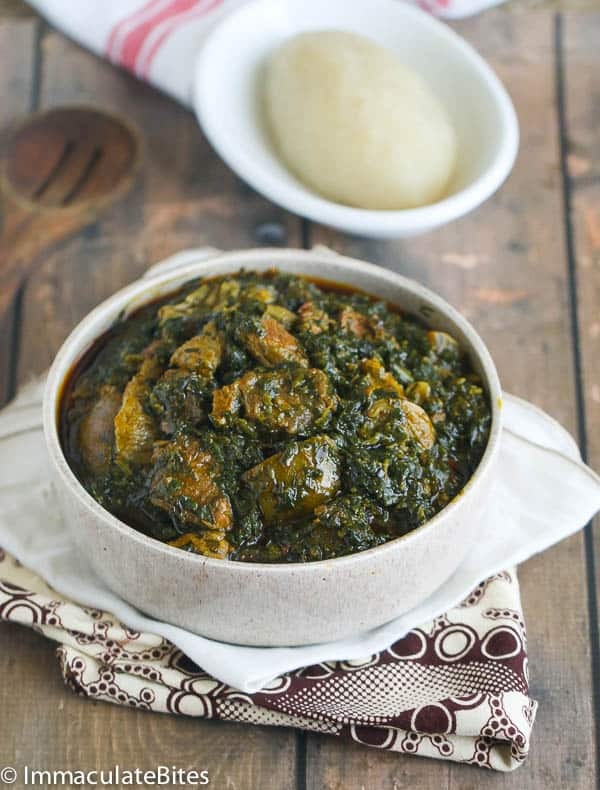 Eru Soup (Spinach/Okazi leaves) – healthy satisfying Cameroonian green dish loaded with other protein and aromatics that will make you sing for joy. Best paired with your favorite starchy sides! Nothing delivers flavor and finger-licking goodness with little fuss and even less time than Eru soup. When I decided to start a cooking blog, the first recipe that crossed my mind was eru. It was at the top of my list of recipes to make, for the blog, because I have been cooking for a very long time and if there is any dish that I how to cook really well, it’s Eru. So it would only feel natural to start with it. I kept putting it off, in favor of other new recipes – baking up a storm in the kitchen. After making it this weekend, it reminded me of why I cook it often -my taste buds danced with joy. Wow! I can’t believe I had not made this in two months! There have been several reports that say; these very popular and nutritious leaves are on the extinct list; unorganized cultivating practices and extreme high demand, let to this conclusion. It would be a sad day for millions of people if that happens. Let’s hope not!! This ever-pleasing meal is very popular in Cameroon and the Bayangis ( a tribe in the south west province in Cameroon ) love it . 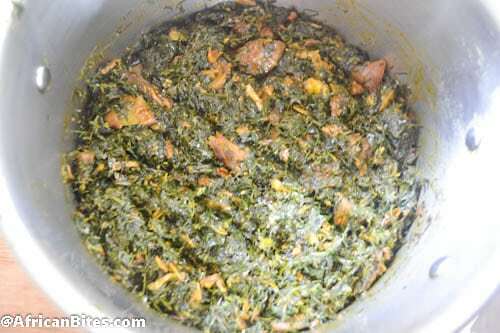 Most people are tempted to use an excessive amount of oil while preparing eru. I have made this several times with very little oil and is quite tasty. If you want healthy eru, cut back on oil and you can eat this meal frequently, guilt free. 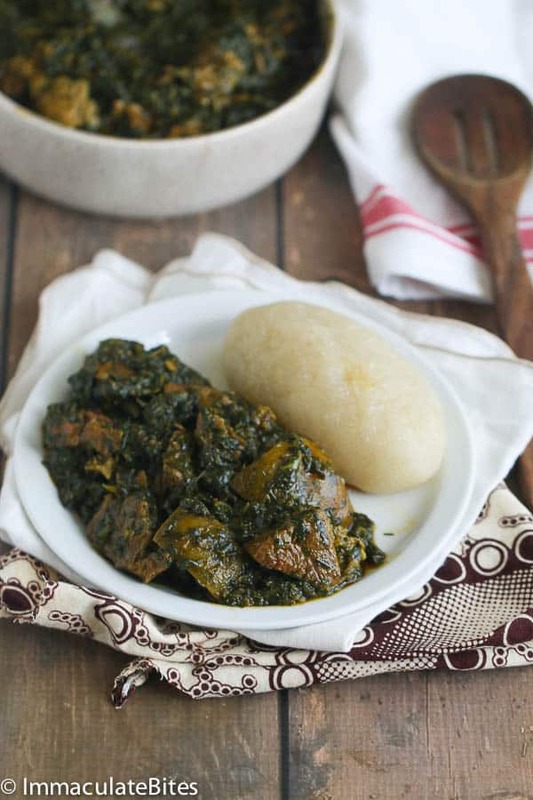 Serve this soup with water –fufu (fermented cassava dough) or any fufu flour. 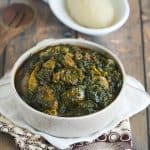 Eru Soup (Spinach/Okazi leaves) - healthy satisfying Cameroonian green dish loaded with other protein and aromatics that will make you sing for joy. Best paired with your favorite starchy sides! Cut the beef in bite size chunks, season with salt, Maggi, and onions and cook until tender. Do the same with cow skin ( they are tough so they take a longer time to to get soft) in a . Use very little water while cooking the meat because eru does not need a lot of water . However, make sure you have at least 2 to 3 cups of stock from the beef. to use in cooking this dish. 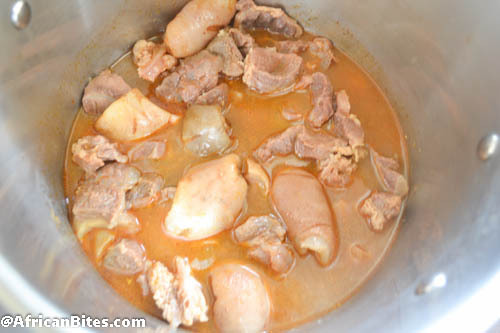 Add the assorted meats - beef, cow skin, tripe a dried fish/ turkey to a large stock pot with at least 2 cups of stock. Bring it to a boil and let it simmer for 5 minutes. 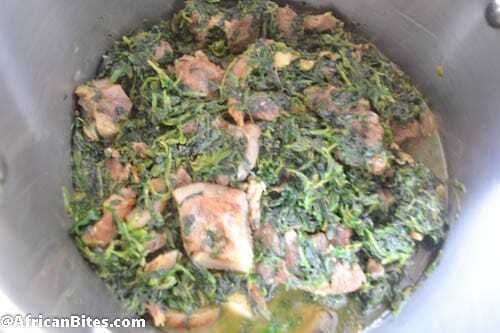 Drain the frozen spinach and add to the pot of assorted meat and fish. Add crayfish and 2 tablespoon bouillon/ Maggi at this point stir, let it cook on medium heat (approximately 10 minutes). 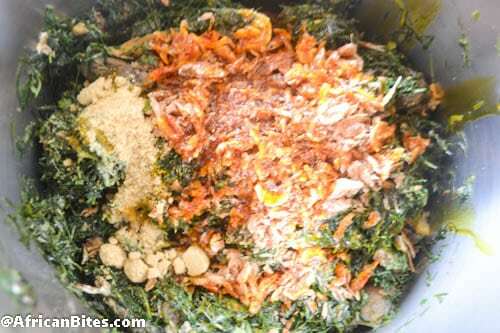 Add shredded Ukazi/Eru leaves, and red oil. Stir again thoroughly making sure all the contents in the pot blend together .Simmer for another 10 minutes, add stock /water if needed . The fragrant smell that erupts from the dish lets you know it is time to eat. Wow….! 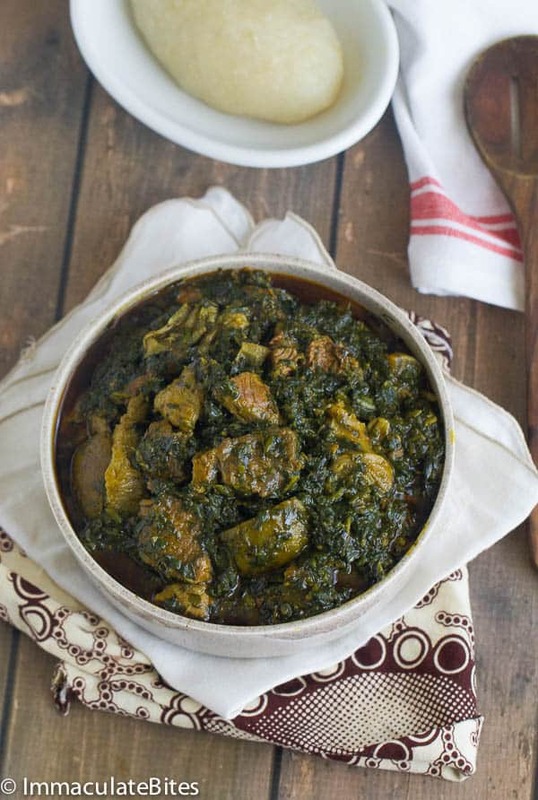 Am so excited, prepared my Eru and Ukazi soup. So beautiful and tasteful. Thank you for uploading it and Happy Women’s Day! Awesome! Happy Women’s Day to you too! Yes, you should. Homemade tastes even better. Thanx so much ma,i’ve learned alot but i dont know if i can use this soup to eat rice? It’s best with Fufu. However, you can eat with whatever rocks your boat. Awesome! I just made it and it came out delicious!! Awesome! Glad to hear it worked out well for you. I have been a fan of yours ever since I came across your site last year! 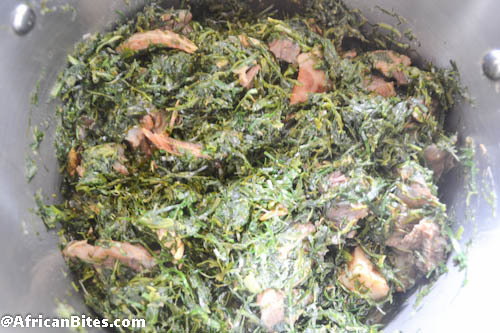 I grew up mainly in US but have always loved my Cameroonian food ! Now that I am married to my beloved super duper Cameroonian sweetheart, I am enjoying being forced to learn the dishes I avoided when mama called me to the kitchen (what was I thinking resisting? LOL). I wanted to ask you if you have ever used frozen Ukazi? 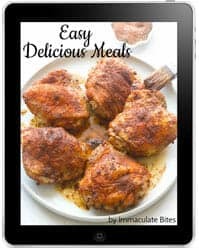 Thanks for your great recipes. I’ve made the baked jollof rice, coconut rice, and I look forward to making many more dishes. Awesome Lb! Thank you so much for reading. AND taking the time to let me know your thoughts. I usually freeze mine if I have excess . And never had a problem with it. Frozen would do just fine. Happy Holidays!!! As soon as I saw Eru I bookmarked your page. YOU ARE THE REAL MVP. All your dishes look and taste amazing, and I will be making some this weekend for a party. Thank you so much and keep up the awesome work. I will try to make eru without my mom’s help and see how that goes because it is my favorite dish. Cameroon in the house. Hi kenny! Always happy to hear from a Camer. Thank you so much for taking the time to share your thoughts with me. YOU are going to nail it! My boyfriend is Cameroonian and I’m American. You helped me impress him greatly as this is his favorite dish!!! Thanks so much. My Pleasure!! Thanks for giving it a try! I read your recipe for eru. Sounds good and thanks for putting this recipe. However, I do think differently about the onion. Yes I know people have different taste and flavor. Thanks for the input Pat! I don’t make it any other way. All you get is added flavor with the onions. It’s hardly visibly anyways. To each it’s own. 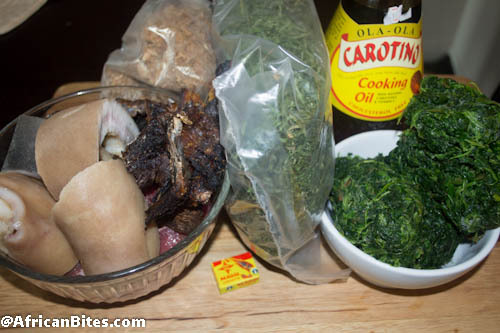 Cooking like a Cameroonian Lady! You go Woman. Eru is pretty tasty! Glad your family is enjoying your hard work. Thank you for taking the time to share your thoughts with us. Miris it sure is easy to prepare eru. Glad to have saved you a trip. Thank you! Thank you! I’ve been looking for this recipe. My fiance is Cameroonian (Mankon) and I want to surprise him sometime soon. He is going to be thrilled with this. Let me know how it works out! Trying this dish for the first time for my Cameroonian husband for Easter. Send me your blessings! I am sending you some easter love and blessings. He must be a lucky guy to have prepare this soup for him. Wishing you all the best during this easter season. Thanks for stopping by! My mom had brought me dried Eru over a year ago and I didn’t know what to do with it. 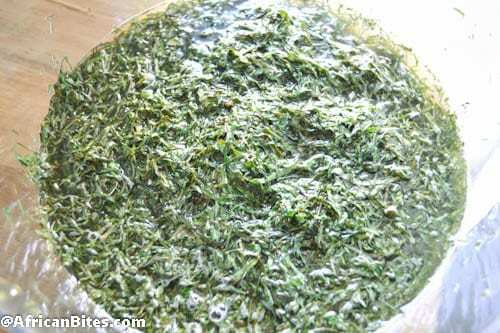 I found this recipe and made a quick stop at my local african grocery store and before I knew it I was eating Eru for Christmas! Best Christmas dinner ever! Thanks so much for posting a detailed recipe with detailed instructions! I’m learning to trust my instincts in the kitchen but it helps to have a solid recipe to start with. Iris , so glad you and your family enjoyed this edu. I had it for christmas too! Thanks for the feedback. Kelsey , I usually use frozen spinach because it is easier for me, but I would go with fresh spinach anytime. 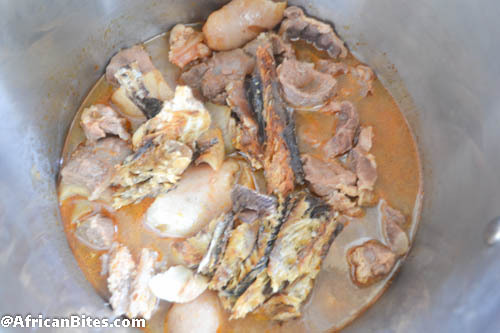 What makes eru really tasty is the crayfish, meat stock and beef. I have made it before without red oil. Taste great but lacks the authentic flavor without red oil. OMG THANK YOU! THANK YOU! 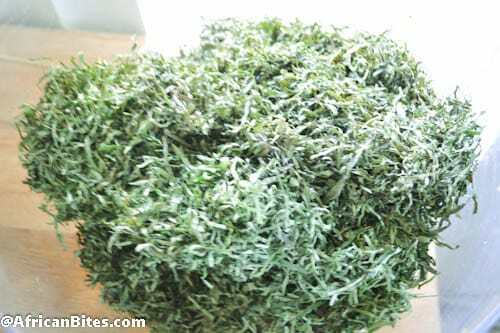 I have been searching hihg and low for a recipe for eru which has precise measurements for every ingredient! This is a life saver and I thank you!!!! I have also browsed through a couple of recipes and I already like your blog. Keep it up Ma’am, and God bless u! !